blurs the boundaries between school and home. Kids learn to use blogs as a personal expression space, which in turn allows them to feel more confident to express their learning to the world. As a teacher, you gain a wonderful insight in to who the students are as learners and as individuals. allows students to see technology as a production tool (beyond word processing) rather than just a place to play games and connect with friends. My apologies for those who are reading this and aren’t in PYP schools, but I don’t think I can link the PDF here due to copyright. For those of you in PYP schools, talk to your PYP co-ordinator to get your username and password for the OCC. Do a search for the document called The role of ICT in the PYP. It’s only recently (June 2011) been revised and published and I have to say that the PYP have hit the nail on the head. A nice blog post from David sharing his thoughts on the importance of developing numeracy with preschoolers. While there are some slides that don’t mean much (as this is part of a workshop presentation I think) there are some real gems in there. For example, slides 11, 12 and 14, just to name a few. www.zamzar.com – converts pretty much any document, image, video, ebook or audio format to any other alike format. I’ve personally found it great to be able to access the information on a Microsoft Publisher file when using my mac laptop (as there is no equivalent to publisher for mac that I’m aware of). There are loads of other uses however. http://media.io/ – I discovered this one earlier in the week when I needed to help a teacher convert a midi file to an mp3 format. This file convertor converts pretty much any audio format to any other audio format. Clean look and free from ads too. I’ve come across this wonderful set of voicethreads this week, via @sherrattsam. I’ve used voicethread before, and seen it used, in many wonderful ways. But the idea of using it as a collection of oral reading samples from throughout the year is terrific! Imagine at the end of the year, you’d have a great selection of books and texts that the child had read that year, each with its own picture, and then the reading sample attached to each one. When it’s completed for that year, you’d be able to sit and literally listen to the progress in reading skills and see the increasingly complex texts throughout a whole school year, in 10-20 minutes. Wonderful! Reading – What do kids say is the biggest obstacle to technology at school? As the title suggests – it’s a list of more than 100 tricks using Google products, from search to email to docs to calendar… the list goes on. I had a teacher come and ask me about converting speech to text for her Early Childhood Education (ECE) kids after having mentioned the iPhone App, Dragon Dictation. This particular teacher would like to keep accurate records of conversations with her very young students, but can find it difficult to keep up with written or type notes. Normally I would have sent her straight to this app, as we are soon to move in to our new campus, we are lacking wi-fi at our current campus. So I did some research and found that Windows 7 has quite a robust speech-to-text facility, called Speech Recognition. This was, it seems, developed as an accessibility option as an alternative to mouse and keyboard controls, however when using it with Word it becomes a speech-to-text program. Now, it turns out that the ECE kids’ pronunciation isn’t quite clear enough for Speech Recognition to be accurate, but this utility does have great potential for slightly older kids. Do a search for Speech Recognition, or find it under All Programs, Accessories, Ease of Access. Follow the tutorial (we skipped the voice setup tutorial), open Word and start talking. Story telling for younger years. Punctuation and other editing development. Have the kids read something, then edit the text (as it doesn’t punctuate and sometimes detects words incorrectly). Of course, there’s the big guys in social bookmarking – diigo, delicious, etc – but for younger students these tools are simply too complex. I’d been looking for a clean, simple bookmarking tool that provided a thumbnail of the linked site. After a quick tweet out, @hechternacht was able to help me out with a great tool called Tizmos. It’s very simple and great for the younger kids – check it out. Unfortunately my first post for this academic year comes as a bit of a grumble. I’ve just returned back from dinner at a lovely nearby restaurant. Eating alone tonight, I inevitably ended up people watching. Sitting at a nearby table was a typical middle to upper socio-economic family from Singapore, comprising of Mum, Dad, Grandma, two young children and a helper (the affectionate term for live-in domestic maids here in Singapore). The two children in this particular family were both boys and aged around 5 and 7 years old. Now comes the grumble. As I sat waiting for my dinner, the older of the two boys was very happily (and loudly!) playing a game on his? his parents’? iPhone. Now let me just remind you that my job now is to promote the use of technology… more on that later. I don’t know about you, but I can’t see these parents letting their child kick a soccer ball around, play a board game, play with play-dough, etc. whilst waiting for dinner to arrive. Why is it OK for him to be playing a digital game? Dinner is a time for families to promote the importance of discussion and open conversations. ‘So, I guess they’ll make him put it away when the food comes out’, I thought. Well, you can imagine what went through my head as I looked up a little while longer to see the boy still playing his game and his father is now holding a fork out, with a piece of food on it, waiting for his boy to reach an appropriate stage in the game for him to lean forward, take the bite and continue on with the game! And this proceeded on throughout the whole meal. I could go on about what I wanted to do and say to the parents at this point, but that would be futile. What I guess I can draw from this, and the many other similar situations we encounter every day, is the importance that we as teachers play in promoting (and modelling!) a healthy balance of technology use for work and play with ‘power-down times’ when we simply turn off the technology. There’s no doubting technology is ever-present in the lives of kids today. There’s also no doubting that it plays an essential role in helping all of us at work to learn, be more efficient, communicate more effectively quickly, as well as to unwind and be entertained. But, there has to be a balance, surely. If nothing more, this observation tonight has reminded and inspired me that as someone promoting the use of technology in my school I also have a responsibility to promote a healthy, balanced lifestyle. Information Processing – In an attempt to have kids understand how their brain collects and stores information, we’ve taken a look at the Information Processing Model introduced by John Josephs. Basically, from the world of information, our brain chooses (or is forced to, or not to, by external influences) to move information through the following stages: sensory memory, immediate memory, working memory, long term memory. You can learn more by contacting http://www.focuseducation.com.au/. Learning spaces in the classroom – I recently rearranged the classroom to allow for a number of different learning spaces. We have spaces that include independent, quiet areas, group tables, reading areas, whole class areas, etc. I share with the students the idea of making a choice of seating based on the requirements of the task at hand. If you need to focus by yourself, find a spot to do that. If you need to work with a partner, find a spot to do that. The kids are choosing well – for the most part. Unfortunately old habits die hard and some kids try to claim a stake on ‘their’ seating position 🙂 We’re working to remove this habit. Behavioural Self Management – we recently set up a STAR corner. This stands for Stop, Think, Act, Reflect. Similar to a time-out corner in that it allows for removal from a situation that’s getting out of hand. BUT, completely different in that the students mostly take themselves to the corner (rather than me ‘telling them off’ and sending them there), it emphasises a focus on thinking about what wasn’t working and how to change it, and it promotes meta-cognitive thought which allows students to improve themselves meaning that hopefully the incidents become less frequent over time. In times when the whole class is a little ‘distracted’ I simply ask them to close their eyes and, without speaking or touching anyone else, count to 10 in their heads, or spell their name, or say the alphabet. Then I ask them to open their eyes when calm, focused and ready to move forward. I’m now seeing kids using this at their desks too – it’s great! I hope some of these simple techniques can help you in your classroom or home too. Without a doubt, the buzz word in our class this year has been BLOGS. Seven months into the school year, and the enthusiasm and enjoyment for blogging in our class is as strong, if not stronger, than day one. The kids are motivated to use their blogs for their school work as well as for personal posts. So what’s so great about them? Well here are seven reasons that I have loved having the kids blog this year. I hope you are inspired to give blogging a go with your students and see similar results. 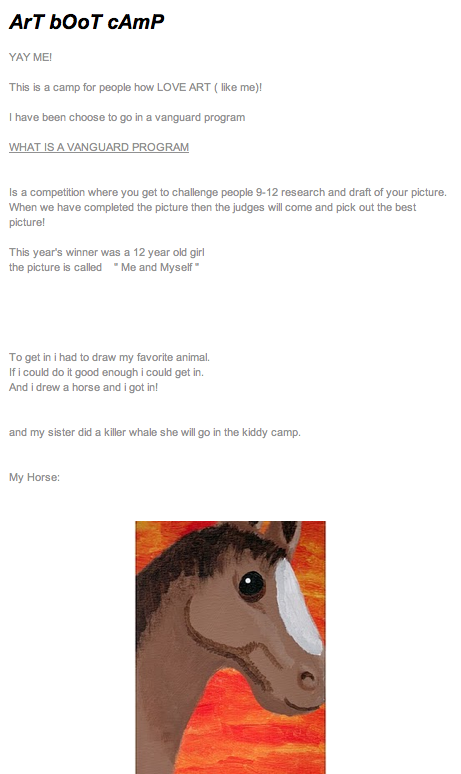 You can check out all of the tasks I have my kids work on on their blogs at my class blog http://mrg-gr4.blogspot.com. There is no doubting that our students are going to need to know how to use and adapt to new technologies. Having students blogging for class and homework has allowed us to learn some of the following skills, beyond the basics of editing and formatting text: embedding video and sound files using YouTube and AudioBoo; embed charts from GoogleDocs, insert photos after using an iPhone to photograph and email them, modify colour and formatting themes, hyperlinking, and the list goes on. Click on the links above to see some examples. We all have them… those quiet students who hardly make a peep in class. Delightful at times, but I can’t help but feel there’s so much I never get to know about them. Blogs have helped me to gain an insight in to some of these kids’ learning by giving them the time and privacy to share their thoughts in a less confronting way. Take the case of one boy whose reading fluency is lacking, not because he can’t read the words as I thought, but because… well you read what he said by clicking the top image to the right. 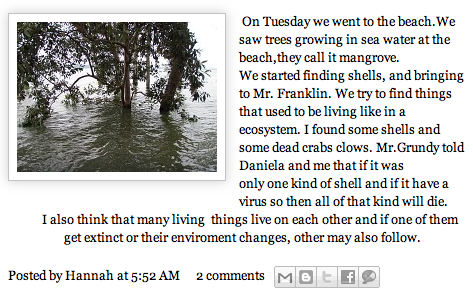 Or there’s the girl who gained an incredible understanding of the concept of why biodiversity exists. I didn’t get to learn about this on the field trip because I was too busy telling her other ‘answers’. When she got home and had the time to process and explain her thoughts, only then did I get to hear her understanding. Starting the beginning of a unit of learning, it’s always a good idea to see what your students know. Well to start our recent simple machines unit, I had the kids watch a video of a Rube Goldberg machine and explain what was happening and why, and what parts of the machine they knew. Later in the unit I had the kids review their post and update it with their new learning. You can see the task instructions here and one example here: first attempt, second attempt. 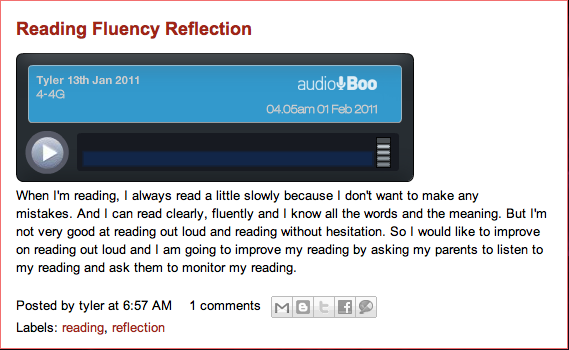 Having kids make reflections of their own reading can be hard when they can’t hear themselves. So, with the assistance of my iPhone and the AudioBoo app I was able to record the kids reading and then have them embed their reading into their blogs. Once this was done, the kids were able to make more accurate judgements on their reading fluency and expression and set goals for improvement. Check it out here. Isn’t it nice when kids have a place to celebrate? Their blogs have become this place. Check out the nice example to the right. It’s wonderful when the parents are able to see their kids work as they complete it. It’s more wonderful when the parents are able to leave a comment sharing their pride. Here’s a nice one. That’s you guys! Please take some time to visit the kids’ blogs who are open and leave them a comment. It will make their day. You can visit all of their blogs here (well the ones that are open at least). In an attempt to engage students in the big picture of their learning, I have tried a number of methods over the years including bulletin boards and slideshow presentations with key visuals to trigger learning. For the most recent reading unit that we are working on, I have begun using www.prezi.com to allow students to see the big picture ideas of their learning right down to the specific details of each learning point. Although we’ve only just started using it, it seems an effective method to engage kids in their learning. This post is partly a chance to share and partly a hope that you can share with me. I have a French speaking student in my class, who 2 weeks ago couldn’t speak a word of English. Over the last two weeks, I have simply been trying to build some vocabulary and basic phrases. I am incredibly thankful for modern technology that has provided me with translation tools and teaching tools. Here are some that I’ve made use of. Please share any that you’ve used or know of that may be helpful in learning English for the very first time. Google Translate: brilliant for translating words and simple phrases. I’m not too sure of it’s ability to translate more difficult phrases and chunks of information. It’s also got the ability to speak the words in the translated language – great for letting kids see and hear new vocab. Spelling City: Great resource, not just for spelling practice, but great to build up the vocabulary for important daily words. Lots of different activities and once again reads the words. Some activities build up word recognition, while others work on understanding. Professor Garfield: This one’s been very useful for building phonetic understandings and also has some stories that are read to the students. iPhone App – English/Francais, Accio Pack: SOOOO handy for translations from English – French and French – English. Have you made use of, or know of, any other useful apps or websites to help ESOL learners build up their English skills? Please share below.